Longreach has two water towers. One stands on the eastern fringe of town, the other, shown here, stands adjacent to the council chambers. The Tropic of Capricorn passes nearby, close to the base of this tower. 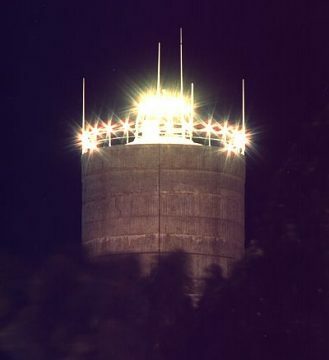 Being near to the Longreach airport, both towers are crowned with a circlet and hemisphere of lights. The effect is quite stunning.